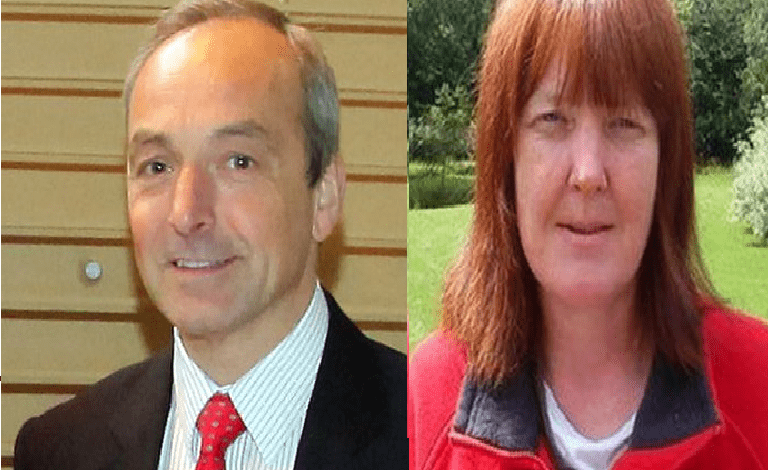 Mark James (left) used taxpayers’ money to sue Jacqui Thompson (right) for libel, claiming she had waged a campaign of “harassment, intimidation and libel” against council staff [Composite: The Canary]. Congratulations to The Canary for getting a story out before I could. If anybody wants to read the gritty details, take a look here, here and here. Is this litigious man consulting his lawyers, do you think? Blogger Jacqui Thompson tried to film a public Carmarthenshire Council meeting in the interest of accountability. She’s now being ordered to sell her home after council boss Mark James sued her for libel, despite him unlawfully using taxpayer cash to pay legal costs. Thompson began filming what she viewed as “the latest travesty for democracy” at the council back in 2011. She felt the council leadership was ignoring strong local opposition to its plans at the public meeting. After trying to film the proceedings on her mobile, the council had her arrested, handcuffed and detained at a police station for two hours. She was arrested on peacekeeping grounds, despite only calmly filming from a balcony. The Coalition government’s guidelines were at odds with the decision to phone the police. They read that kicking people out of council meetings only for filming is “at odds with the fundamentals of democracy”. In the aftermath of her arrest, James accused Thompson and her family of “running a campaign of harassment, intimidation and defamation of council staff”. The arrest received a lot of negative press. So Thompson viewed James’s online post as a character assassination attempt and sued the council boss for libel. But James successfully counter-sued, with the judge ruling that Thompson conducted a smear campaign as “revenge”. James is now forcing the sale of Thompson’s family home to retrieve damages which have risen to £35,392 after interest. The mother has 14 days to respond. Unlike the council boss, Thompson will also have to pay her own legal costs of £190,000. you also knew about this case, mike. yet chose not to report it. If you’ve read the piece, you’ll see that The Canary got its report in before I was able to work on it. I didn’t choose not to report it, and would have produced something of my own if the other blog had not. i did read the piece, mike. and i have read the story before, too. the ceo blows his trumpet about it at every opportunity – including on his own blog. i am surprised you missed it is all. it has been going on a while now. Yes, I had a message about it on the new feedback form a few days ago – which indicates to me that it is a worthwhile innovation. a) did the legal dept advise him on ultra vires? b) did the Council’s Elected Members discuss this and approve it? In my experience of local govt, Council’s can only pursue legal action against rent or council tax defaulters not libel. It’s up to the general Public whose funds this councilman availed himself of to boot him out and sue him for breach of ethics and unlawful abuse of his position, notwithstanding his fraudulent use of funds which were never his to use. I consider his lack of any ethics or morals as a yardstick of the political party he stands for and the (in my opinion) corrupt council he works for. Revolving the story around the rights and wrongs of whose cash was spent, while valid, does not address the principle. The state’s intention is to spy on everyone, so lets take a page from their book and further Jacqui Thompson’s principle. Attend meetings, covertly record the anti democracy facades and publish them on the web. Covert equipment can be obtained for just a few pounds, it’s worth it just to expose the real goings on. I think the real business goes on behind closed doors, not in public meetings. Just like at Westminster? This is disgraceful and is setting a very dangerous precedent for other Councils & Councillors to abuse public funds for their own means. Another typical councillor, wasting taxpayer’s money again! Too much abuse of process being used to cover up the crime of theft and human rights abuse.